For purchase information on "THE ART OF PRINTING FROM NATURE", click here. Nature printing is an ancient art form that takes objects in nature and, through the use of a wide variety of techniques, transfers the beauty of those objects into art. 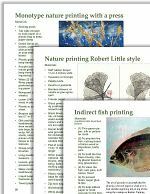 The Nature Printing Society is the largest, international organization existing solely for the purpose of promoting and encouraging nature printing. We help disseminate educational materials and support acquaintance and cooperation both among our members and with the general public. 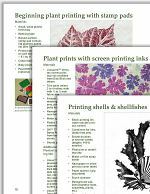 We encourage publication of articles about nature printing, demonstrations of printing, teaching of printing classes, and organization of displays, exhibits, and shows of nature printing. Membership in NPS includes our beautiful quarterly newsletter as well as an opportunity to attend our annual week-long conference held each year in a different location. Browse our website to learn more about the history of nature printing, the work of our members, and upcoming nature printing events. 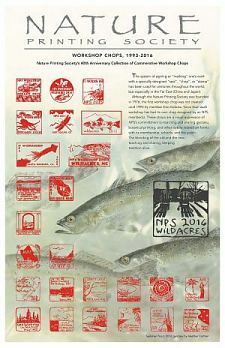 The Nature Printing Society is a non-profit arts organization dedicated to the education, the history and practice of the art of nature printing, and to those who support our philosophy of respect for nature through the art of the print. Membership is open to all who share this vision. The Nature Printing Society is excited to announce our newest printing guide, "THE ART OF PRINTING FROM NATURE: A Guidebook, 40th Anniversary Edition". 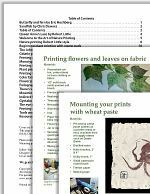 This, our latest printing guide, has grown from 80 pages to 132 and been updated to 35 chapters. 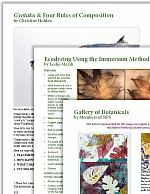 Over 20 different authors have shared well over 400 color photographs of techniques, instruction, artwork and inspiration. Chapter subjects include gyotaku (fish printing), botanical printing, how to work on cloth and fabric, eco-dying, color theory, printing spider webs, making spore prints (mushrooms), and doing cyanotype. 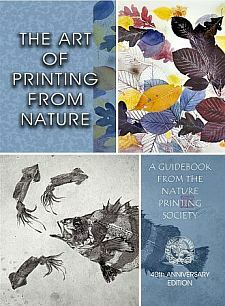 This is the most comprehensive book on nature printing methods we've ever published as contributing NPS members are all experts in these techniques.